The history of Renju and other five-in-a-row games. In Japan they played with these rules on a 19x19 Go-board since many years and maybe since about 700 A.D. when Go was introduced in Japan from China. The game was often called Go-moku but other names are known for example Kakugo, Gomoku-narabe, Itsutsu-ishi, gobang, morphion. Scientists in Japan are discussing if the very old game kakugo mentioned in a writing from the year 100 A.D. is a five-in-a-row game. When the first book on our game was published in the year of 1858 A.D. the game was called kakugo. The ancient Chinese game of wutzu is also considered to be the prototype of the Five-In-A-Row games. However I think and also other players that the rules are so simple that it is possible that people from different parts of the world may have discovered the game without knowing each other and maybe on other planets Universe they are also playing the game with the rules 1-2 above. As a matter of fact it is difficult to find many other games that probably are played on other planets. I doubt if I think of chess or Go and probably they do not play Renju exactly as we do either. 6 December 1999 Renju became 100 years old. The name of renju has a beautiful sound and it means five pearls in a row. Goraku Takayama, who was the first permanent Japanese Meijin, named this game "Renju" and made information in Yorozu-Chouhou newspaper 6 December 1899. In the year of 1899 the Japanese players also began to play more organized. 1899 they tried to play with forbidden double-threes for both players to make it more difficult to win. To make a double-three is to make two threes with the same move. Gomoku is an ancient strategy game with origins in China dating back to earlier than 270BC, originally played with smooth black and white colored stones. It is similar a popular modern european game. However, instead of just requiring you to connect a row of four, you need to go one further and connect 5 in a row wih Gomoku. Considered by many to be one of the worlds greatest strategy games, Gomoku was introduced to Japan by the Chinese in 270BC. The full name of Gomoku is actually Gomoku Narabe, which is Japanese for "five points in a row". Japanese chronicles show that at the time of the late 17th and early 18th Century Gomoku Narabe was at its height of popularity, being played by young and old alike. By 1880 the game had reached Europe where it is also known as Gobang. PS Znalazłem również wzmiankę o gomoku w książce Arthura Smitha The Game of Go - The National Game of Japan z 1908 roku. Trochę to fascynujące, że gra się do pięciu, a nie do czterech albo do sześciu. Chciałbym zobaczyć podstawy matematyczne tej sytuacji. Ale możliwe też, że nie chciałbym. Do tej pory odbyły się dwa turnieje rangi Mistrzostw Świata w Gomoku oraz dwa turnieje Gomoku towarzyszące Mistrzostwom Świata w Renju. Wszytkie pod patronatem RIF. The following is an interview about the rise and decline of gomoku in Poland, conducted by me with Piotr Małowiejski, also known as Angst. I found him to be one of the most suitable persons for such an interview, as he is one of the most experienced, knowledgeable, and influential persons in the Polish gomoku community. Piotr played in about 40 live tournaments shown on gomokuworld.com, the first of them dating back to 2005, and he successfully led the Polish team to the first world championship title in 2016. He captains Dark Team, one of the strongest Euroleague teams, and is also the Polish representative in the Euroleague committee as well as one of the main organisers of the upcoming world team gomoku championship in Poland. The interview is below. My questions are in italic font, while Piotr's answers are in normal font. Note that Piotr emphasises that what he says here is his personal opinion and not an official statement of the Polish Federation of Gomoku, Renju and Pente. I want to ask you something about gomoku in Poland. I asked Usiek, and he gave me his answers, but strongly recommended asking you, because you, in his opinion, know better. The reason why I am asking is related to a discussion on the Russian gomoku forum about the choice of the tournament formula for the Russian championship, and people there refer to the Polish experience. Long story short, many Russian players strongly advocate organising the Russian championship as a single Swiss system tournament open to everyone (like in Poland), but some other players, particularly Katsev, are strongly against it, preferring the current formula, which is a complicated system of qualification tournaments from which people advance to a final tournament that is played as a robin-robin lasting 4 days. One of the arguments used by Katsev is as follows (I quote): "Look at Poland, where the national championship is a big open Swiss system tournament. And each year less and less people come to play. Last time there were only 7 Poles, if my memory serves me. And there are no other Polish tournaments in any other city. Why do you think that in Russia such a system would lead to a different level of participation? In Russia, travel is even more expensive/difficult than in Poland." Since Poland has been mentioned, I want to clarify things, so I would like to ask you some questions. 1. What do you think the main reason for the decline of gomoku in Poland is? Why less and less people play in the Polish championship? Why even the strongest players like Puholek and Zukole often refuse to play in the Polish championship? Is this somehow related to the choice of the tournament formula (Swiss system)? 2. Why did gomoku become quite popular in Poland about 10 years ago? Usiek says there were local gomoku clubs in Warsaw, Cracow, Rzeszów, Białystok, and Gdańsk. How was that achieved? 3. In your opinion, is there any realistic way to stop gomoku from declining in Poland? 4. Based on your Polish experience, what advice could you give to the Russians about the choice of the tournament formula for the Russian championship? It is important to understand how it looked in the beginning. I do not know all details, maybe there was something before 2002, but definitely the most important thing was Kurnik. I played gomoku (known then as "tic-tac-toe to 5") at my high school. Probably it was a level not higher than Kurnik's 1300, and no one knew there was an Asian name for this game. I accidentally found Kurnik and started playing there. At that time, the number of players simultaneously logged in was not higher than 15-20, and most of us knew each other, usually only online. Then Utratos proposed Maf to change "gomoku" to "tic-tac-toe" on the main page, and this may have been really an important factor as suddenly more and more people started to play. There were also foreign players, and people started to compete more seriously. There were first online tournaments, international matches, etc. People generally liked others, and especially those were liked who played fair, not using programs. And one day some of us decided to meet live. Zakon and I had been roommates in a dormitory for 5 years, so it was not hard for me and him to decide to meet each other. And we knew there was a guy living in the same town, and he agreed to meet live. Inspired by us, he shared his idea to make something professional, and we declared that we would support this. This guy was 100per, the first chairman of our Federation. 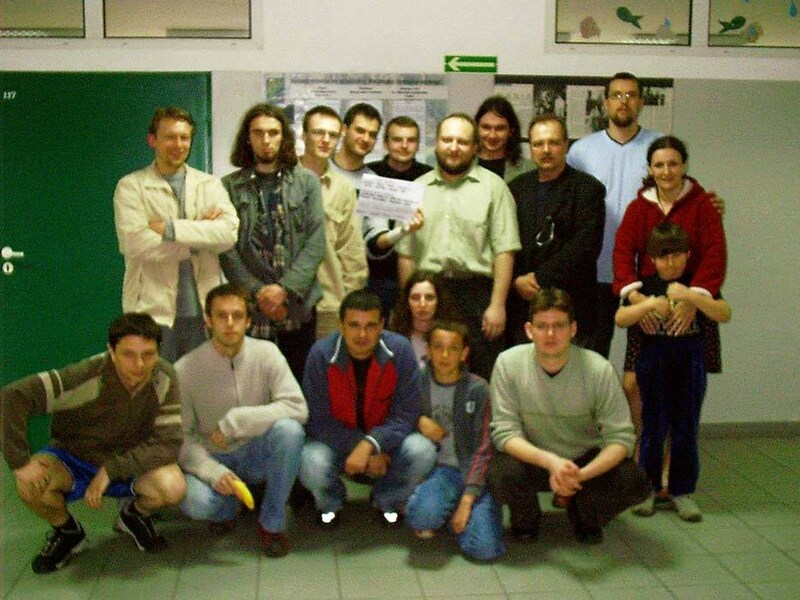 This was 14 years ago, and then we were able to organise 4-5 tournaments per year, counting gomoku, renju, and pente. The people who played at that time were of different ages, say, 15-60, but the majority of them were rather 20-30 years old. During the first years some people decided to quit, but others joined. But as time passed, more and more people quit and less and less people joined. In my view, the main reasons well may be very prosaic: less free time and a loss of big interest to play. Usually only the winner could say that he had more money after the tournament than before it, as each participant had to pay for his travel and accommodation. The prizes were relatively small. The "social" reasons could not be motivating enough, as in relation with a try to make our competitions more professional there was less space for fun. Only those who had a real passion for gomoku stayed, and not every one of them stayed forever. Some of us got bored, others found other hobbies, and as people get older, they usually get more home/family/job duties, which does not help. To overcome this, a higher popularity of the game is needed. Look, for example, at Czech Republic, where school competitions are organised. Also, a good sponsor really could help. I also want to add that while live tournaments are an essence, the online activity is, and probably will be, a basis. Therefore, it is very important to organise interesting, challenging online competitions. I think that the players who are still interested to play in live tournaments come to play from time to time, and if such a player refuses to play in a particular tournament, it is probably usually just due to a time or money trouble, nothing else. Some of them are possibly bored by ordinary tournaments, so only the world championship or the world team championship can motivate them. I really doubt that the tournament system has an important impact on their choice or somehow discourages new players. I suppose that the main reason why gomoku became popular in Poland about 10 years ago was the effect of novelty as well as a poorer choice of forms of activity as compared to what we have now. Concerning the novelty effect, some first "official" tournaments on Kurnik were joined by more than 200 players. Can you imagine? I found you in the photo. You did not change much. I see a decline in the number of Polish players playing online. I have heard that the new Polish generation is simply less interested in logic games, which is allegedly the reason why less people join Kurnik. You see, both you and Usiek joined Kurnik on your own, not influenced by any gomoku player. Apparently, now simply less young people join Kurnik like this. This is the only explanation I can see. I think it is a too general statement. Now people have a much richer choice as to what to do, as compared to what was there 10 years ago, and, also, nowadays young people seem to have more tasks and activities like additional lessons. At my preliminary school, the only obstacle for playing football was finding a ball and place, and once we found these, we all were playing football. Computers were slow, and we had few games to choose from. And now you can do anything. I do not think that young people like to think considerably less than before, but they now have much more possibilities and probably are a bit more pragmatic. Young people may think, "Why should I waste my time if I cannot earn money here? Let's play poker then." Thinking like that may be popular. But poker was there in 2005, too. I am quite sure that in 2005, poker was not that popular or not that easily available. Do you think the Polish gomoku federation could do more to popularise gomoku and to keep people involved, e.g., by organising more tournaments, by awarding official titles like "gomoku grandmaster" and "gomoku master," and by contacting journalists and asking them to write articles? Maybe more tournaments could be an opportunity to attract more people. And do you think that the way how the federation works may be not optimal? For example, if someone wants to organise a live tournament, he has to ask a permission. Sure, our federation theoretically could do more, but the problem here is basically the same as the one with participation in live tournaments - other duties and a lack of free time. It is hard to do things if you go to work and have a family. Concerning organising more tournaments, we previously had to cancel tournaments because of a low number of registered players. And anyone can organise a tournament without a permission - it just will not be recognised as official by our Federation. There may have been some tournaments we do not even know about. How can you comment the fact that the Russians are able to organise about 10 tournaments per year? I think they are Poland about ten years ago But there is an important factor - they have a longer tradition, and some of them are possibly bored by renju And the population of Russia is approximately four times as large as the population of Poland. By the way, does the Polish gomoku federation have any official status, any legal documents, or is it just an unofficial group of friends? It is complicated, but we can say it is an official sport association. Some Russians seem to believe that by using a complicated qualification system for their national championship, they can make gomoku more attractive and interesting. What do you think about this idea? My only advice is to be in touch with all active players and to listen what they say. Surveys are sometimes found not necessary, but I do believe they can be helpful in some cases. Yes, we did a survey for the WBC and changed the tournament formula as a result. This may serve as a good example, but probably it is also good to make a change from time to time. How can you answer question 4? That is, what advice can you give to the Russians about the choice of the tournament formula for the Russian championship? Is a single Swiss system tournament open to everyone the best solution? I do not know much about the current situation in Russia and do not find myself competent to give specific advice on this matter, but I can say that there is no ideal tournament formula that suits all situations. If the number of participants is high, organising a qualification may be a good idea. It also depends on the possibilities of the players, e.g., whether the players are able to join a few short tournaments per year or rather one tournament lasting a week. So the tournament formula has to be adjusted to the needs and possibilities of the players. Why does the Polish championships last only two days? Is it because you, the Polish federation, fear that a longer tournament would repel many potential participants? Dont you think that a longer Polish championship could become more interesting and attractive in the long run because its games would be deeper and of a better quality as a result of a longer time control? It is a kind of a compromise. We think that longer tournaments could be a problem. Also, some players may want to keep a reserve of free days for international tournaments. The Russians are able to organise a final tournament as a round robin for 10 participants lasting 4 days, with the time control being 90+30. Playing in such an interesting tournament seems to be a factor motivating some Russians to stay in the gomoku world. Very good for them, but I doubt there would be 10 players willing to join such a tournament in Poland. By the way, who will play for Poland in the team championship? Is there any new info available in addition to what is stated at the official website? I have no additional information. Possibly, Adifek and Utratos can be still considered as potential participants, but we should rather ask them. Why even the strongest players like Puholek and Zukole often refuse to play in the Polish championship? Beznadziejny przykład. Puhol był na MP w latach 2007-2016, a ja 2008-2016. If this article was not there, my sentence would indeed prompt such a response of yours, because the sentence would basically have the following meaning: Why do even Zukole, Puholek, and possibly some other players who are among the strongest often refuse to play in the Polish championship? In other words, the absence of the definite article "the" would mean that I am talking about some undefined players who are among the strongest, not about more or less all strongest players, and thereby would very strongly imply that a considerable part of strongest players do not often refuse to play in the Polish championship and that Zukole and Puholek are introduced as examples of strongest players who do often refuse. The presence of the definite article "the" drastically changes the whole thing. Now the players I am talking about are defined, and they are defined as the whole group of all players who are like Zukole and Puholek in terms of strength. So, to put it simply, the meaning is as follows: Why is even the elite, defined as the group of all players who are comparable to Zukole and Puholek in terms of strength, largely apathetic towards the Polish championship? In total, 9 refusals by 5 players in 5 years, which amounts to a refusal rate of 36% (calculated as 9/(5x5)). It is this big number that my sentence was basically about. Zukole and Puholek were mentioned merely as reference points on the rating/strength scale. Gentlemen, it is hard for many of you to fully appreciate and feel the role played by articles in sentences, as you do not have articles in your own language. The articles in English are a very powerful tool, and, more broadly, English is an extremely precise language thanks to its variety of modal verbs, the presence of articles, a clear difference between restrictive and non-restrictive clauses, etc. . . .Thanks for the English lesson sandra113. I can promise you we will appreciate role of articles in sentences as much as we disapprove your lack of common sense. . . .English is extremely precise language, so please show us where Polish elite gomoku players made their refusals to play in Polish championships. fail to perform a required action. stop short or run aside at (a fence or other obstacle) instead of jumping it. Look at meaning 1. I believe that non-participation pretty well indicates that the player is not willing to participate. An act of refusing to do something. 1.1 An expression of unwillingness to accept or grant an offer or request. 1.2 An instance of a horse stopping short or running aside at a jump. I really see nothing wrong in using the word "refusal" in this context. After all, it is their own national championship, and they are elite players. They should play. People look at them and copy their attitude. Failure to participate in the national championship sets a bad example for others. Participation in the national championship by an elite player is a contribution to making gomoku more popular. And the elite players often fail to do what they should do, expected to do, and invited to do - to participate in the national championship. And this is the flavour I intentionally wanted to convey by choosing the word "refuse." And in my previous post I provided a table showing all refusals by the elite players in the past 5 years. . . .I can appreciate them without using them properly myself. On a sidenote please focus on topic of this thread, you can make linguistic (and other) comments in designated threads in hyde park. . . .Poland is independent country and Poles have free will. Perhaps you can reconsider telling others what they should do? 1. Late announcement of tournament/inability to get a holiday from work. 2. Lack of free time in general (occupied with more important things than hobbies).